Bookburger: c'mon...get creative this summer! ok, we know you'll be lazing around the pool a ton this summer--but why not think amazing, inspiring, great-artist thoughts while you're doing it? 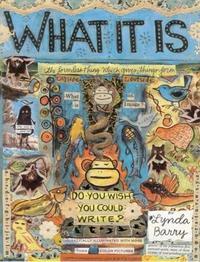 We at the burger have always been huge Lynda Barry fans. If you don't know her, you really oughta check her out...and now she's got a book that will get you jotting down your own brilliant, funny creations. It's called What It Is, and it'll help you remember that "the ordinary is extraordinary," as Ms. Barry says. We're going to be perusing it at the beach....along with a few trashy Gossip "Girl novels! You've been nominated. Stop by my blog and check out the details. Hello! We thought you and your readers might like to receive a free full-length novel, Jumble Pie, a heartwarming story about two women, a friendship, and a pie. The author has two published novels (Penguin Putnam) and is providing this as a thank-you to readers! Visit http://www.melanielynnehauser.com/JumblePie to request a copy. Although not exactly relating to the thread please allow me, dear friend, to tell you of the newest home of British comedy on the online. English For Dirty Foreigners is the only show on the internets that will lie to you outrightly about British language, traditions, customs and stuffs. Oh yes, we have many stuffs. I saw her at Comic Con. She was great!!! Wherever did you people go? The most correct way to check out the quality of the thesis writing services is to buy some good thesis paper connecting with this topic in dissertation writing service. It sould be really practicable to buy thesis abstract just about this good post in the dissertation writing service especially if students don’t have time. Your article just about this topic is solid and scholars would simply take it for their write my essay information or research paper literature review. I guess that is a really great solution for guys which do not really have a lot of time to buy essay papers. But for me, this is more workable to use a support of the best writing services. Good suggestion. Lets do something good on this summer. This is really good idea to spend your holiday enjoy fully. Thank you for encouraging me. Where can I get the book? thanks for posting man. I am also a big fan of Ms. Linda..
She was definitely great in Comic Con.. I like her a lot.. If you don't know her, you really oughta check her out...and now she's got a book that will get you jotting down your own brilliant, funny creations. Hi readers and authors! My novel "The Invisible Enemy: Black Fox" has just been published. It's a spy thriller written by a Dept of Defense Insider that reveals a secret that will bring America to it's knees. It's been getting great reviews so far, but I'm always looking for advice and tips on how to connect my book with my core audience, and even get book reviews from book lovers and fellow authors. Always looking to connect with fellow authors and network as well. If you'd like, you can check the book out @ www.anthonyrhoward.com . The book is available on my website, Barnes and Nobles, and Amazon, etc, On the blogs the book is being compared to "24" the TV series. That's cool as I thought it was a great show. Any comments, feedback or reviews are appreciated! wew! Arnold was my idol before. i never knew that Arnold has this issues, well, thanks for this blog anyway even though im a bit of late on this one. Seriously, where did you guys disappear to?